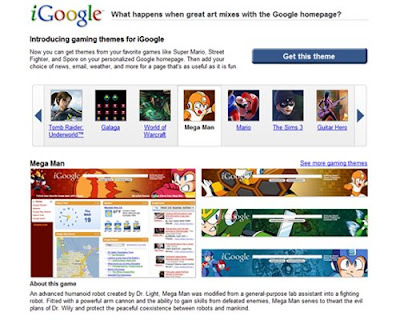 Yesterday Google introduced all new gaming themes for iGoogle. There are a wide variety of gaming themes to choose from including Super Mario, Mega Man, Street Fighter IV, Zelda and Spore. This is a great addition to the iGoogle theme offering and now gives gamers a way to further personalize their iGoogle experience. Here's a shot of my iGoogle header with the Street Fighter IV theme. For more details, check out the iGoogle gaming themes page. Cool! Never though Google would do this, but seriously Google will end up doing everything one day..
Yeah, it seems like every year I'm using more Google products than the last. It's good to see Google getting their game on though.